As pointed out last week in this publication, General David Petraeus’ reputation appears to be built upon a foundation of public relations sand, a foundation that is quickly becoming quicksand. More and more publications and reporters are now beginning to take a hard look at the General and what they have written about him in the past. It appears that his greatness has been a media creation, one that he directed and fostered. My observations in the above mentioned article are based on my observations during a 30-year military career culminating in an assignment as a staff officer for the logistics division of the Joint Staff. I have worked for and observed several generals and am quite aware of what it takes to be a Flag Officer. Quality of work can only take you so far. It takes some “politics” to get a star. Unfortunately, “politics” can carry an individual event when the quality of his work is suspect. This seems to be the case with General David Petraeus. Unfortunately, the incompetence of a general can have disastrous consequences for his soldiers/sailors/marines/airmen and the nation. 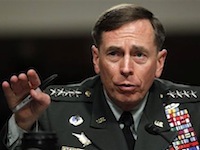 How many lives has it cost to aggrandize David Petraeus. The following two articles are the latest, but probably not the last, commentaries that judge the General on his generalship, not on his private life. Might the United States have accomplished much the same thing without putting tens of thousands more troops in harm’s way? I’d argue that it’s quite likely. But Petraeus’ hagiographers have written a history that enshrined the general as the savior of Iraq, an interpretation that he was more than willing to aid and abet. By the time President Obama was elected, Petraeus was the Republicans’ favorite military man, a widely recognized war hero and a person often mentioned as presidential material. According to people who know him well, he liked to fuel the rumor machine that kept his name among the mentioned. He was head of U.S. Central Command, one of the military’s top jobs. Given the fact that Bush had encouraged politicization of the military, it came as no surprise when top brass — notably Stanley McChrystal, whom Obama later fired — began pressuring Obama to send thousands more troops to Afghanistan. But it was sheer coincidence that Obama ended up appointing Petraeus to take McChrystal’s place as top commander in Afghanistan after McChrystal’s insubordination became impossible to ignore. Site contents copyright © 2019 Recorder Online	except as noted. All rights reserved. | 91 queries in 2.135 seconds.